What is that saying? How do you eat an elephant? One bite at a time. I never really understood that, but when I’m cleaning I guess that is how I efficiently get things done, one bite at a time. A clean and organized house does wonders for your mind and attitude. But we’re busy right ladies? So, here is a little trick that I use so I don’t become overwhelmed… I use a timer, a regular old kitchen timer to pace myself and to figure out how long it actually takes to clean a specific room and or area. For example, my living room for the most part stays decent, so when I need to do some dusting, sweeping and sprucing up, I set my timer for 10 minutes and get to work. When I do this I’m less likely to bunny trail off into another room leaving a bunch of unfinished rooms. The timer also helps me to determine the amount of time it takes to clean a room, so I can plan my week out more efficiently. Kids also love timers and I strongly encourage making a chores a game for them by setting the timer and daring them to beat the clock. 1. Pick out a kitchen timer if you don’t already have one. You can get one at the Dollar Store or get a cute vintage one like the one above from www.thinkgeek.com . Set the timer for each room for the amount of time you think it takes and make a mental note of what rooms need more attention and will take more of your time. Also if you can stick to the allotted time you give yourself. 2. Start cleaning the easiest room first. Quickly finishing a room gives you a boost of confidence and is a motivator to go to the next room. 3.Stay focused on the room you are cleaning. Hopping around will only frustrate you. 4. Take a break in between rooms. When I get tired I get cranky and then I’m done. If I take a break after one or two rooms I’m more likely to have the energy to go on. 5. Make a list at some point during the week of the chores you want to finish, so you can cross them off your list without forgetting. 6. Before you go into a room, make a mental note of everything you need to clean that room. 7.Make the most out of every minute and don’t put off what can be done today. My junk drawer was a little too junky! These 2 bins were a $1.00 a piece at the dollar store. They’re easy to fit in the drawer and keep items neat! Toiletries can take on a life of their own. Clear off the shelves of your medicine cabinet and lay everything out in a basket or on the floor. First clean your shelves off with a damp cloth, it is amazing the amount of grime that accumulates. Get rid of any expired medications, old makeup, sample colognes you’ll never use, half filled shower products, worn down soaps, old toothbrushes, or any items you simply don’t use that are taking up space in your medicine cabinet. Next, logically arrange your medicine cabinet. If all of your products won’t fit in the medicine cabinet don’t overcrowd it, instead purchase inexpensive storage bins or baskets and place them in your linen closet. I’ve acquired quite a collection of hotel samples over the years, too many to possibly use, but hate to just discard them. If you face the same dilemma donate them to a woman’s shelter. Shelters are always in need of toiletries. If you decided to donate them ask your friends to get involved in the donation. I love to wrap up in a big cozy towel after showering and have a number of towels to prove it! If your bathroom is small don’t pile up towels in an already cramped space. Roll your towels spa style and neatly stack them in a linen closet. If you don’t have a linen closet, be on the lookout for shelves to place over your toilet or a corner. Before doing this, take inventory of your bath linens, do you have towels that have seen better days? Pitch them or use them for cleaning, or if your kids paint you can use them for cleanup. 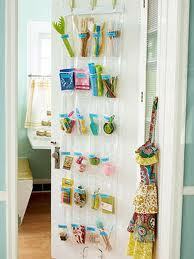 Hooks are another option for hanging towels, robes, etc. You can buy ones that hang over the door or pegs to hang under shelves. Shelves are an inexpensive and simple way to add more storage to your bathroom. You can purchase shelves for about $5-$20 depending on the size. On your shelf fill apothecary jars with Q-tips, dental accessories, cotton balls, or bath salts. Make your bathroom pretty! If you have a master bathroom that you don’t share with the kids make it your oasis! Even if you share a bathroom, hang up some pictures, place a few candles on your shelf or bring the outdoors in and add a couple small plants on the windowsill. Bring a little peace in your bathroom. I have small picture of my daughter as a baby in her tub on the wall, wind chimes hanging above the window and a small lamp with a soft light, it is small but cozy. Messy bathrooms are not fun for anyone! Make rules about putting towels in the hamper and not leaving them on the floor. It is better if everyone cleans up after themselves. How often you clean the bathroom, is probably dependent on how dirty it gets and how many people use it. In my household it is only myself Anya, so I do a thorough cleaning once a week, consisting of scrubbing the tub, toilet, sink and floors. Don’t forget to clean the liner when you’re scrubbing the tub and wash the shower curtain once a month. If there is tough grime buildup on mirrors or inside the medicine cabinet trying using a razor to remove it. Pay attention to odors in trash cans, spray them with disinfectant and rinse them out. 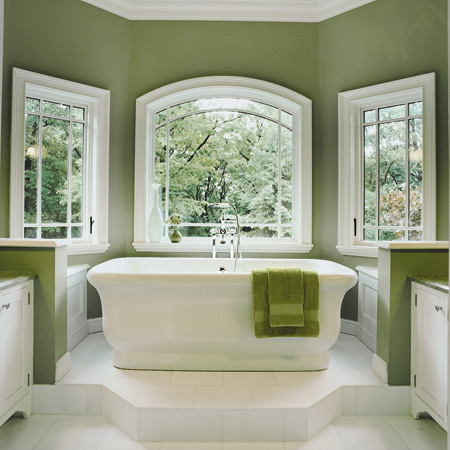 Now your bathroom is neat and orderly take some time to for a relaxing bubble bath, read a book, and enjoy your space. I am welcoming spring with open arms! After a long winter my body is craving sunshine and spring breezes. Spring is a time for renewal and rejuvenation both for your body and your home. Spring cleaning is both therapeutic and rewarding. Cleaning out the clutter and sweeping out the old while ushering in the new is good for the whole family, it is like a cleansing. Spring cleaning can be simple and here are some tips to keep in mind when you begin. Think about what you want to accomplish. Maybe it isn’t cleaning the entire house from top to bottom. You may want to focus on the one area in your house that has been a thorn in your side for the past three years. Focusing on a goal for your home helps you target exactly what you want to attain and keeps you from getting overwhelmed. Never underestimate the power of a list. Lists are a great way to stay organized, while keeping your goals and to do list on task. If you plan on cleaning all the rooms in your house make a list for each room. Write what you want to accomplish in each room, be specific, and keep track of your progress. If your kids are spring cleaning their room, give them a list to eliminate miscommunication and they’ll know exactly what you expect of them and you can track their progress. Before you sweep up those cobwebs make sure you have all the cleaning supplies, storage boxes, and any other resources you need. Nothing throws you off your cleaning groove more than running out of window cleaner or paper towels. Create a separate list of all the supplies you need and purchase them in advance. Save money by going to the dollar store for sponges or paper towels. Life is busy! Moms are running in a million different directions so don’t place too much pressure on yourself. If you expect to thoroughly clean your house from top to bottom in two days and you have three children, a dog, and other obligations most likely it isn’t going to happen. Think about your daily responsibilities and fit it in where it fits. Set your expectations to meet your lifestyle. Don’t neglect to set expectations because then nothing will get done, but be realistic. Spring cleaning doesn’t have to be exclusive to cleaning. It can include rearranging the furniture, changing the color of a room, or adding new pieces to a once dreary nook in the house. Spring conjures up a sense of renewal so while a thorough cleaning is a great detox for your home so is switching it up and adding something new! Also with all the tragedies occurring around the world donating home goods or clothes is a wonderful way to help out those in need. Check with local and international charities to find out how you can help. The beauty of a family is that you aren’t alone. Too often moms take on the role of superwoman which only makes them frustrated, overworked, and exhausted. Involve your family from the youngest to the oldest and make it a family project. Kids want to be included and should be. You are part of a unit so make sure you work together as a team. Assign each family member a chore and hold them to it! It is easy to become overwhelmed, but don’t give up. Keep going and stick to your original goal. If you procrastinate the task only becomes bigger the next year and the stuff keeps on accumulating making the next time you decide to return to it worse. Once you finish you’ll feel relieved, uncluttered, and you’ll love the results. Open the windows, put a fresh vase of flowers on the table, plant some seedlings and enjoy the springtime! Make spring cleaning satisfying and manageable. Take time to smell the roses while clearing out the old to make room for a new season! Families and friends love to gather in the kitchen for conversation and food. The kitchen always needs attention. If food is overflowing from the cabinets or the junk drawer is junkier than you can handle here are some simple ways to bring order and cleanliness to your kitchen. Drawer Organizers- Are you tired of rummaging around for your cutlery? Put a drawer organizer in to hold all of your silverware. Draw organizers also work great for the junk drawer. You can have miscellaneous items in a drawer, but they don’t have to be unorganized. Containers- Use containers for opened boxes of pasta, cereal, beans, rice, flour, and sugar to save space in your cabinets. Pot Racks-If you lack cabinet space, racks provide a great alternative for spare storage for your pots. Storage for Under the Sink- The space under the sink is always neglected. Purchase some inexpensive bins to store dish soap, sponges, scrubbing pads and cleaning products. Food Cabinets and Pantries- These areas tend to get messy. Try this four step approach. 1. Empty the Cabinets– Take everything out of the cabinets, wipe each shelf with a damp cloth or use a dust buster to vacuum any crumbs left behind. 2. Discard– Discard any canned goods whose expiration dates have passed. If you have multiple boxes open such as pasta put them in canisters and discard the boxes. 3. Categorize– Separate your food by category. You may find categorize the most used items together works best for you. 4. Arrange– Designate a specific place for your cans, boxed foods, breads, and condiments, along with items such as wax paper, sandwich bags in your cabinet or pantry. Wash dishes daily. Avoid leaving dishes in the sink until the next morning, this only creates more work. Make it a household rule if you use a dish, you wash it. Save time, energy, and water by using the dishwasher, instead of hand washing your dishes. Always clean the sink. Use baking soda to clean the sink and shine it up with Windex. A sparkling sink will motivate you to clean the rest of the kitchen. Clean your refrigerator once a month from the inside out and top to bottom. Clean your oven once every other month unless you have a self cleaning oven. Clean grime from burners and knobs on a weekly basis. Every two months clean your cabinets. Scrub your floor once a week or once every other week. The Swifter is a great alternative to getting on your hands and knees or using messy mops. Clutter seems to just sneak up on you. I for one function better when I clear out the clutter. There is something serene about living in a simplifed space clear from all the junk that tends to pile up. Here are some tips on quickly clearing out the clutter. 1.Get a box and go from room to room and pick up the visible clutter. Set a time limit and quickly walk through to do a surface decluttering. 2. Do you have a fondness for magazines like I do? Magazines pile up quick and can take up a lot of room. Take an afternoon to look through all your magazines and tear out articles you want to keep. Put the articles in a fold or binder. If you just can’t get rid of the magazine purchase some magazine holders and put them on a shelf. 3. Junk drawer too junky? Buy a drawer divider to keep things neat. 4. Mail all over the place? Get an inexpensive accordion file folder and organize your bills. If they are more than a year old pitch them. Better yet, sign on for online statements so you can keep them in a file on your computer. 5. Each season examine your closets, if you have clothes that no longer fit get rid of them! Put them in a bag and drop them off at a shelter or planet aid. Or if you want to make a few extra buck try to sell them on Ebay or Craigslist. You may want to have a yard sale once the weather gets better. 6.Go through your medicine cabinet every couple months. If there are expired medicines or old makeup pitch them. 7. Linen closets are great for storage if you utilize them well. Roll your towels spa style and save tons of room. Look at your washcloths and towels if they have seen better days take them out of the linen closet and use them for cleaning and store them in your cleaning supply area. 8. Containers, containers, containers! Get as many as you need for storage of toys, holiday decorations, etc. Label your container s and arrange them in a way that makes sense for you. 9. Clean under the bed. I’m always amazed at the stuff found under beds. Clear out anything under your bed and find a home for it. If you have to use the space under your bed for storage try to find flat storage boxes to fit snugly underneath. 10. Under the sink is always neglected. Remove any almost empty cleaning supplies or dish detergent. Inexpensive bins work great in the bottom of sinks to store brillo pads, sponges, and garbage bags. 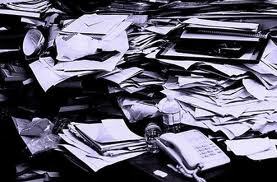 Check Out This Great Site for Organizational Tips! I’m always searching for ways to bring order into my world. I came across this website that has a ton of great information and resources! It has tips on food and recipes, work life, organization, money, etc. Check it out! ﻿﻿﻿﻿﻿﻿﻿ Make your kids responsible for putting their dirty clothes in their own clothes hamper. Anya’s is a flower and it has a great strap that makes it easy to carry. They are inexpensive and it is a great way for them to help out and make life a little easier on you. You’ll probably see less clothes on the floor also which is a BIG PLUS!